Finish glamrockers Lovex strike once more with their last outing Watch Out. The album is their third after 2006 Divine Insanity and 2008 Pretend Or Surrender. The band was founded in 2002, started recording tracks two years later and scored a few hits with a bunch of singles taken from Divine Insanity. They are pretty popular in Finland and the rest of Europe will no doubt follow shortly. Reason for EMI Germany to sign them for this newcomer. The band has always been master of melody and Watch Out is no exception. The album differs somewhat from its predecessors in being more accessible, but the change isn't overwhelming. The reason the album sounds more poppy, more mainstream than the previous ones maybe due to the fact that Watch Out was produced by the band itself. The good news is that this is surely no reason to shift it aside, the album sounds very mature and energetic. And in relation to their previous efforts, the quality hasn't dropped a millimeter. Opener Queen Of The Night is a discorock kind of a track that comes storming out of the speakers. The saxophones are pretty unusual for a rock track, but somehow it works out surprisingly well. It also tricks you in a pleasant way. The remainder of the album is more in line with the Lovex we are familiar with. Pinpointing standout tracks is impossible, but I found the albums finishing four tracks simply great. Very catchy and melodic stuff that gets better with every spin. This disc must be the perfect support for a high road trip. Personally I like the band best when they lean more towards AOR with tracks such as Time Of Your Life, Worlds Collide, One and Marble Walls. But to be honest, there is no weak link spotted her. In the keyboard driven segment of Eurometal where Brother Firetribe rules, Lovex has firmly cemented it's place with Watch Out. The boys from Tampere do not beat their compatriots, but they are getting close. Very close. 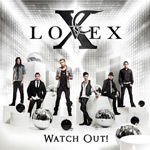 In the keyboard driven segment of Eurometal where Brother Firetribe rules, Lovex has firmly cemented it's place with Watch Out. The boys from Tampere do not beat their compatriots, but they are getting close.